Fall is a fantastic season for dating! It’s when I got together with my husband, so I might be a bit biased! Lovers can find each other and begin an exciting courtship just in time for the holidays. Having a fun date for seasonal gatherings and office parties can make the holidays go from semi-tolerable to terrific. 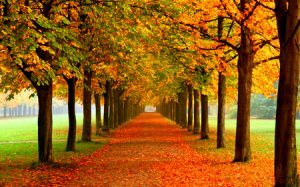 1) One fall date idea could be a walk or hike to see the leaves change. Talking walks together allows for quality time to really drop in and get to know someone. The cooler weather also provides respite from the heat and sweat that can collect on clothing in the summer season. Even if you are a little nervous, being outside in fall can hide the anxious, armpit sweat! 2) Another fall date idea is going to a pumpkin patch. This can be fun for new couples to feel like kids again, wandering through corn mazes and picking up pumpkins to carve together back at home. Being able to play together is important for all couples, and a skill to also take into the bedroom. 3) Another fall date idea is a farm to table dinner, at a farm if possible. Because it’s the harvest season, there are many new foods being brought in from the fields. Breaking bread together as a couple is also a key component of companionship. 4) A last date idea is going to a yoga class together. Fall can be a little cool and chilly, so the warm room for a yoga class can feel refreshing and relaxing. If you still have those new date jitters, yoga can be grounding, and even if you don’t, yoga is beneficial for our bodies. Doing healthy activities as a couple starts the build the foundation of a healthy life together. 5) After yoga, if you want to continue the date with a little sweetness, go home and make a pie together with the yummy pumpkins you got from the patch on a previous date! Don’t forget the whip cream and forks to feed each other. Sharing food together can be very sensual and bonding.